Sh Ch Kalimor Celtic Storm at Aarranz JW. This is an activity conducted all year round and all over the UK. It's a very popular hobby and great social event. 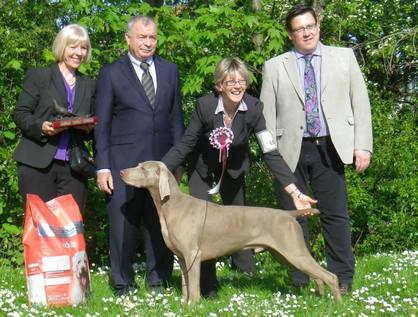 It is a competition held under Kennel Club Rules and Regulations where approved judges assess a dog's conformation to a breed standard to find, in their opinion, a dog which ideally meets that standard. Judges penalise any features or exaggerations which they consider would be detrimental to the soundness, health or well-being of the dog. There are three main types of show: Championship, Open, and Limited Show. There are also Companion Dog Shows, held for fun and often used as charity fund raisers.